Looking at the Fos. 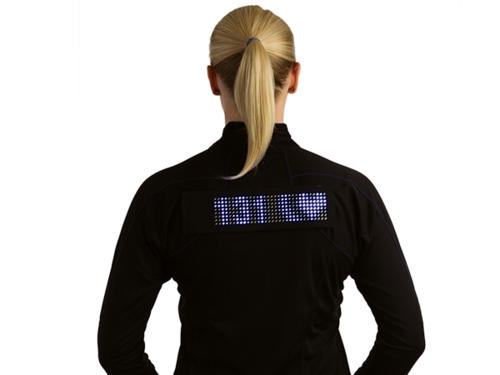 Wearable LED display. The Wearable project I’m working on is entirely a one off, a prototype, a what if? sort of project. Its an idea to show what can be possible,to learn and test out the technology and to gauge people’s reaction to it. Recently I discovered the Fos project on Kickstarter .This is a project that uses an array of LEDs to display information sent from a mobile phone. The Kickstarter page shows an example of an exercise statistics app but there are more ideas in the video and as it comes with an API for Android with an IOS one to follow the possibilities are much wider. I really like the idea of this. I think it would be even more awesome if it could connect to an Arduino board based board like the Adafruit Flora to enable a more direct connection of other devices such as switches, light sensors and gps but can see that would add a lot of complexity to an already ambitious project. Another thing that impressed me about this is the dedication that Anders the developer of the Fos has had to the project. This isn’t a fly by night operation, he has been working on similar projects as bespoke designs for since 2005. I don’t know if Fos will reach a massive consumer audience. The big players Apple, Google and Samsung are more likely to achieve that. I can see it finding a niche and hopefully other developers will come up with ideas that use the Fos in interesting ways and lead to other projects and devices. Posted on August 31, 2013 by Catherine Jones. This entry was posted in technical, thoughts, wearable. Bookmark the permalink.